‘Bill Lynch’ at The Douglas Hyde Gallery is only the fourth solo show of the American painter and his first in Ireland – all of them posthumous. Lynch created his pieces using a signature style of oil on wood coupled with extensive scraping and paint removal. He was one to avoid the pristine and muted surface offered by a canvas, preferring to alternate between boards that were either custom-made or scavenged from his surroundings. This flexible approach sees the odd nail protruding from the paintings, while some pieces have smatterings of woodworm on their frayed edges. While Lynch’s unorthodox process has led to the work’s present delicate state, it also hints at a working methodology that operated at a frantic pace, driven by passion. This pace appears at odds with the delicate approach to subject matter and the care afforded to the paint’s application. This is an exhibition where energy and immediacy coexist with intimacy and control. The dichotomy of the paintings intrigues, enhancing the already beguiling and lush brushstrokes. 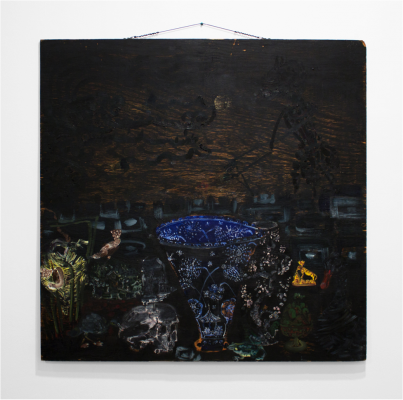 In pieces such as After Chao Insect + Branch and Untitled (Blue Vase), the influence of both Eastern and Western traditions on Lynch’s development is apparent. But these motifs are woven into the capture of the familiar and familial worlds that surrounded him, with his companion Sammy the dog appearing in several works. Lynch’s paintings operate on several levels, the raw surface of the boards become backgrounds, voids created by the erasure of paint become spaces for contemplation, each action precisely considered to elicit a reaction. The exhibition is marked, but not dominated, by the tragic events of Lynch’s personal life – he battled with schizophrenia in adulthood and refused medical treatment after being diagnosed with cancer, before he passed away in 2013. This is a carefully curated show, many of the 16 paintings have been selected from private collections by his friend and fellow painter Verne Dawson and another friend, Michael Wilde, provided the accompanying texts. The involvement of those who were close to him makes for an exhibition that is both emotional and evocative. Bill Lynch was in The Douglas Hyde Gallery from March 4th to May 4th, 2016.